’12 Angry Men’ is a true timeless classic. The film examines prejudice and the sheer callousness of human behaviour, issues which will forever be relevant. After being retired by a seemingly indifferent judge, a vote declares that 11 out of the 12 jurors are happy to see the accused, an 18-year-old Latino from the slums, be executed by the state. Initially this seems unremarkable, you assume that they all have good reasons for their verdict. However it’s soon apparent that most of the jurors have just glossed over the facts, reaching their damning conclusion because they ‘just think he’s guilty’ – there’s even one juror who can’t wait to leave the room so he can go to a baseball game. Only Juror #8 (Henry Fonda) is disturbed by the hastiness of it all; he doesn’t know whether the kid is guilty, he just wants to at least talk about it before the jury so swiftly condemns him to death. I’ve praised films such as ‘Killer Joe’ for their success in engrossing its audience despite much of its story occurring in very few locations. However, compared to ’12 Angry Men’, ‘Killer Joe’ is a veritable action adventure – this legal drama never leaves the jury room. Its success in gripping its audience and fully involving them in the characters and plot is a masterful achievement of writer Reginald Rose. At the table sits a spectrum of personalities, all of whom you can identify and resonate with. Some are measured, some are fickle, some are blinkered and one or two are downright pig-headed and obnoxious. The natural, timeless performances allow you to cross-examine them; they are all personalities one has come across before, and the viewer can probably draw parallels to people they know – this is one of the film’s core strengths. Sidney Lumet’s debut feature is to be lauded for its reserve and lack of sensationalism. There may be those who doubt the credibility of the some of the case developments, but to my relief, I personally found few if no traces of hyperbole or implausibility. 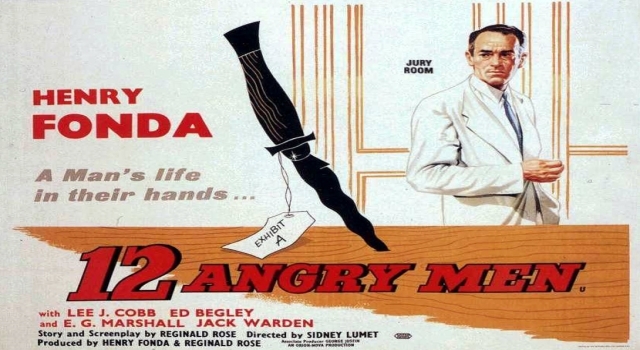 ’12 Angry Men’ is a film that I truly admire, a timeless classic that deserves the attention of all generations – it will continue to live on as many of its contemporaries continue to date.